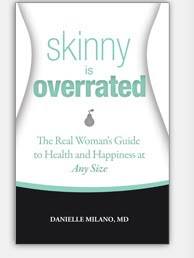 According to Danielle Milano, MD, author of Skinny is Overrated: The Real Woman’s Guide to Health and Happiness at Any Size, "If you put a bulldog on a diet, you don't get a greyhound." The point is that your genes have a lot to do with your weight, so some people are just not going to be skinny. And that's okay. Dr. Milano says you don't have to worry about being in the "healthy weight" category of the Department of Health's Body Mass Index (BMI) chart. Many people would never be able to achieve this. Instead, she recommends you adopt a healthy lifestyle of eating the right foods and exercising regularly, without worrying about your specific weight. If you do this, you'll likely lose weight; but even if you don't lose a lot of weight, you'll be healthy. I think this is a great way to look at health and weight. But then Dr. Milano begins to outline her program. She goes over all the foods you should avoid, and explains that you really need to exercise for at least 20 minutes every day. This is where she lost me a bit. I don't feel that I could commit to such a restrictive lifestyle. If I tried to follow all of her recommendations, I think I'd fail. I do see how Dr. Milano's plan can lead to a much healthier life, but for me, it seems a bit unrealistic. I do like her recommendation to focus on eating more vegetables regardless of the diet you choose to follow. [Most of the book is focused on the Mediterranean diet, but she suggests you look at your own ancestral diets to get ideas for healthy eating.] She even includes several recipes at the end of the book, mostly focused on vegetables. She offers menu ideas and tips on outfitting your kitchen with the right ingredients and tools. Overall, this is a decent book about living healthier. It includes nutrition information that is especially geared toward those with or at risk for diabetes. I couldn't follow her plan completely, but I still got some good tips to apply to my own healthy lifestyle. Dr. Danielle Milano is board certified in internal medicine and currently practices in East Harlem at the Boriken Neighborhood Health Center, a federally funded community health center, where she treats patients suffering from obesity and diabetes. Earning her doctor of medicine from New York University School of Medicine, Dr. Milano is also an adjunct clinical professor at the Mount Sinai School of Medicine. This review was written based on a copy of Skinny is Overrated that I received from Phenix & Phenix Literary Publicists.